The new design depicts St. Paul within a West Coast Salish setting, as having arrived by canoe. The background setting is representational of an inlet, a traditional structure and Coast Salish canoe. It was determined that the icon would have no leafing on the background or halo (gold, copper etc.). Instead, the painted frame around the image would be the colours of the four directions. The canoe is positioned as ready to go back out on the water for St. Paul’s further journeys. The central feature of the icon is St. Paul himself. He is depicted as being Coast Salish, wearing a cedar hat and holding a talking stick in his right hand, and a cedar bough in his left. I believe that it is important that Coast Salish and Indigenous Peoples see themselves as bearers of the Good News and have a shared experience of St. Paul within their church. faith will grow strong in the truth you were taught, and you will overflow with thankfulness. St. Paul’s Garb: In order to keep the icon as inclusive of all Coast Salish and Indigenous Peoples, and with each Clan having its own customs and designs for blankets worn (material used, ornamentation, function, roles and status) it was decided to keep St. Paul in a simple tunic and outer garment. The outer garment is a heavier cape/blanket (also know as a himation) in a solid earthen colour. His inner tunic is in a deep red to signify his martyrdom. Cedar hat: A traditional hat in it simple cedar weave, and again, no ornamentation has been added in order be inclusive of all. St. Paul is portrayed and Teacher/Messenger and is in the act of ‘journeying’. The project was collaboration with Romeo Crow Chief of the Siksika Nation. The request followed the Coast Salish icon of St. Paul in Vancouver. 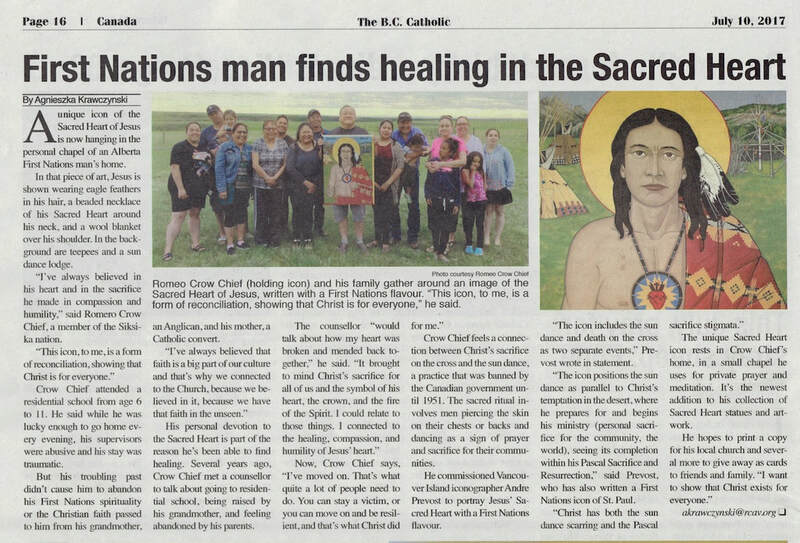 It addressed the need for an icon of the Sacred Heart for the Blackfoot/Siksika Nation, portraying Christ as Blackfoot and also connecting to the Blackfoot tradition of sacrifice for the community within the Sundance. b) A lifelong 24/7 commitment, in service to the community. The icon includes the Sundance and Death on the Cross, as two separate events. Even though aspects of the Sundance could bear similarities of piercing and sacrifice, the icon keeps the two as separate, hence the scaring from healing with continued life versus the unhealed wounds after death. The icon positions the Sundance as parallel to Christ’s temptation in the desert, where he prepares for and begins his ministry (personal sacrifice for the community, the world), seeing its completion within His Pascal Sacrifice and Resurrection. Christ has both the Sundance scarring and the Paschal Sacrifice stigmata. The icon is positioned within a traditional setting, including a Blackfoot Tipis and a Sundance structure, all placed in the Alberta foothills. The tipi in the front bears the design for Romeo Crow Chief’s family. The entrances to the two tipis face the centre of the icon, both to Christ and to the Sundance structure on the opposite side. Instead of the traditional images of the Sacred Heart where the emblazoned heart is depicted on Christ’s chest, a Blackfoot/Siksika beaded pendant is adapted to depict the Sacred Heart in traditional beadwork. The choice for the blanket was a red pendelton. A pendelton is an iconic wool blanket with its distinct woven patterns. The inclusion of the feathers was to be based on an archival photo of Chief Crowfoot, where he wore his feathers to the left side of his head. The feathers are based of Plains eagle feathers. The differences within this icon are two-fold. Aside from it being set within a First Nations context, unlike most traditional icons of Ste. Anne where she is depicted along with the Theotokos, the prime focus of this icon is of Ste. Anne as ‘grandmother’. She is portrayed as a Plains First Nations grandmother in traditional regalia and with her grandson Jesus Christ, also in regalia. Saint Anne embodies the grandmother figure, having a respected place in Aboriginal societies, and pivotal within the preservation and teaching and formation within ‘the culture’. This icon is set within the dance, a culmination of this teaching with her grandson, who in turn is so loving and honoring of his grandmother. The dance is central to Indigenous culture, and based upon honour, respect, joy, and the ‘learning from the elders’. This dance setting has Ste. Anne and Christ portrayed as the ‘Head Dancers’. ‘Head Dancers are the designated female and male dancer , who are appointed to lead all the other dancers. This position is one of honour, with all other dancers offering the deserved respect. For any given set of songs, no other dancer will dance until the heads dancers commence.’ www.shannonthunderbird.com. This symbolism is central for the icon, both within the actual cultural setting, but also within the global community of Faith. Ste. Anne is wearing a fringed white buckskin regalia with a pale ochre yoke, and with beaded white moccasins and leggings. Jesus is portrayed as a young man, also wearing traditional regalia in reds and blues. Ste. Anne’s face as looking upwards (indicating vision) and Jesus is looking afar (indicating his awareness of what is to come). The setting of the icon is representational of Lac Ste. Anne. *See ‘Lac Ste. Anne pilgrimage site’. The icon is written on a panel of Baltic ply on a 1 ¾” stretcher frame and has a narrow painted frame in colours seen in Ste. Anne’s regalia; pale ochre, black, and a fine russet red outline. The sides of the panel are each painted in a colour of the four directions; white at the top, yellow on the left, red on the bottom, and dark blue on the left. The icon was completed in time for the 2017 Lac Ste. Anne Pilgrimage, held in July at the Lac Ste. Anne Pilgrimage Grounds in Alberta, Canada. In 1876 Pope Pius IX declared her as the Patroness of Canada. “A long-established annual meeting place for Aboriginal peoples, this lake became a Catholic pilgrimage site in the late 19th century. Since 1889, First Nations and Métis people have travelled here in late July to celebrate the Feast of Saint Anne, widely revered as the mother of the Virgin Mary and the grandmother of Jesus. Saint Anne embodies the grandmother figure honoured in many Canadian Aboriginal societies. Lac Ste. 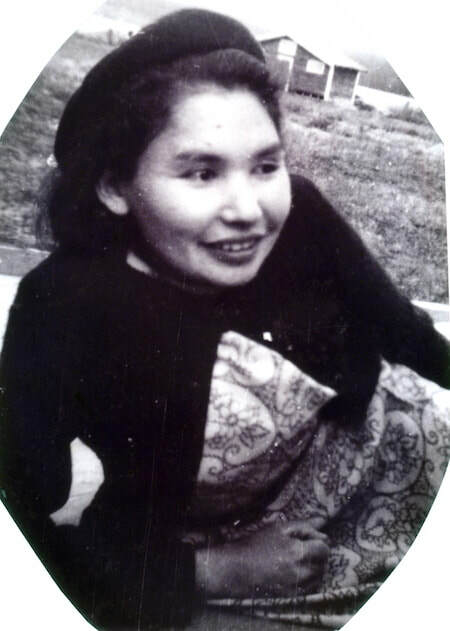 Anne is an important place of spiritual, cultural and social rejuvenation, central aspects of traditional summer gatherings for indigenous peoples. In the past, Native families, who in the fall had scattered to winter camps and trap lines, gathered in the summer for the buffalo hunt. First called Wakamne or God’s Lake by the Alexis Nakota Sioux Nation who live on the west end of the Lake and Manito Sahkahigan or Spirit Lake by the Cree, Lac St. Anne is the site of the annual Lac St. Anne Pilgrimage, one of the most unique and memorable spiritual gatherings in North America. The pilgrimage to Lac Ste. Anne blends well with traditional Aboriginal spiritual beliefs and cultural practices. Aboriginal cultures have strong female figures and, generally speaking, grandmothers have a respected place within this society. As the grandmother of Christ, Saint Anne can be accepted into this tradition. The pilgrimage, which takes place on the week of her feast day, July 26, coincides with the time when traditional summer gatherings were held. The pilgrimage allows Aboriginal people to once again come together to visit, to share and to celebrate much as they did in the traditional summer gatherings. Today as many as 40,000 pilgrims make their way to the shores of Lac Ste. Anne. Many come in search of healing and spiritual renewal. This pilgrimage, has become the largest annual Catholic gathering in Western Canada. 22" x 28" Archival Acrylic and 23K Gold on wood covered with gessoed muslin. 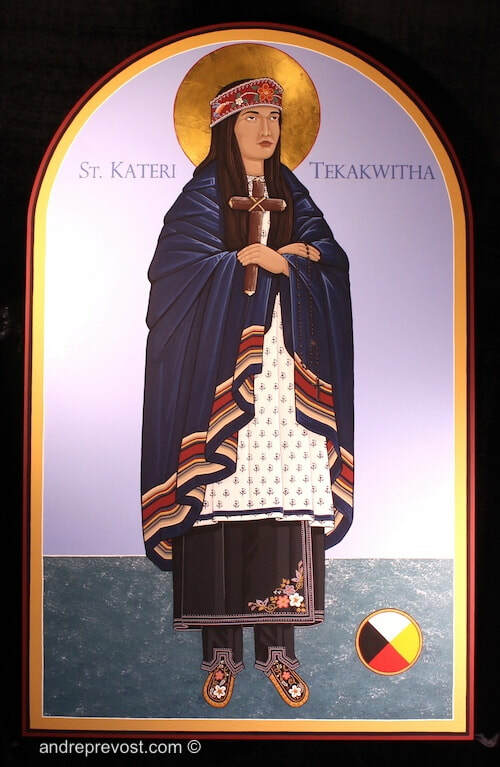 The direction for the St. Kateri icon was to be as historically authentic as possible. Through research and prayer, and asking for St. Kateri’s guidance, I began with the one early portraiture of her. But I found that it was too small and didn’t provide enough detail, other then asserting St. Kateri as being from the Mohawk/Iroquois Nations. After much research online, I found that most religious art images were not best suited for an icon, and a great many defaulted to the buckskin/braids and with non-indigenous features. And there was no conformity in how she was portrayed. St. Kateri’s face would have no scaring from the smallpox has they cleared shortly after her death. The icon was to present her glorified nature. The Mohawk regalia would be added (yoke and cuffs). Being a torso icon, the distinctive dress and leggings were missing. The delicate pattern on her garment was based on a French pattern of the era. The image would include a hand-made cross and a rosary. At this stage, the shawl was draped over her shoulders. It was going to be a dark indigo as it was commonly used. And of course, the initial design had the braids. 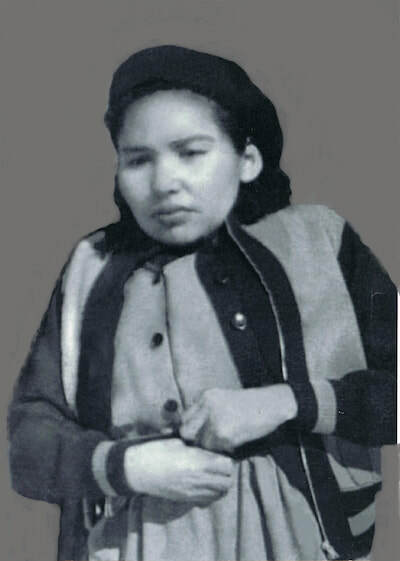 - ‘She wore a shawl to protect her poor sensitive eyes from the sun because her eyes were severely affected by the smallpox that took the lives of her parents and brother, and her hair can loosely hang down perhaps over her shoulders.’ She also agreed that the original portrait of Kateri Tekakwitha would be the closest, adding that the Iroquois and Mohawk regalia are the same. “The Iroquois Confederacy consists of 6 nations: Cayuga, Mohawk, Oneida, Onondaga, Seneca, Tuscarora... The traditional Woman's dress is usually in 3 pieces as you have shown and elderly women wore a shawl on their head.’ She reemphasized that I not portray St. Kateri with braids as she would have worn her hair loose. So the design was changed to loosen St. Kateri’s hair and the shawl was placed on the crown of her head. The replacement of the shawl was partly based on how covering her head would have been second nature to her, but also because of a) how she had wanted to start an order of nuns for Indigenous women, b) avoided visibility as she was also hiding, having escaped to avoid being forced into marriage, and c) given her religious aspirations and the norms of that era, a young woman being bare headed would have been considered improper. When commissioned to write an icon of Rose Prince, the journey began in gathering all available information about Rose Prince, her story, and the discovery of her uncorrupted body. I had seen the painting of Rose, which has been part of the grassroots devotion and pilgrimages to her grave. It is a caring image which establishes Rose’s identity by being depicted in a buckskin dress, and holding a talking stick. With the residential school portrayed in its background, my sense is that it was a means of highlighting Rose’s sanctity in an institution, which remains a strong trigger for many others. But the imagery of the painting posed a few challenges for the icon. An icon requires that it leads to prayer and not be political or posing conflicting questions around the residential schools. It was important that the icon be about Rose Prince. With the icon having a gold leaf background, the issue of the Residential School imagery was not an issue. The task was to find the connection to Rose’s interior life within an environment that she chose to remain in, primarily because of her physical restrictions, and her spiritual need to remain close to Jesus and Mary. In the hope of finding Rose, I initially looked for internal images of the chapel and workrooms. I knew that the Chapel was central to her life, as was her work with the students. The other path of discovery was how to portray Rose herself. Although a member of the Dakelh (Carrier) Nation, there are no pictures of her in Traditional Regalia. There was no need to superimpose anything upon her as she herself was/is an Aboriginal person. But then, there were only a few blurry pictures of her, and the challenge was deciphering what I was seeing. There were no records as to colours etc. She wore her sweater with a small cross pinned on it. Two pictures showed her in a light coloured brocade patterned dress. I chose to make her sweater an Indigo Blue instead of the assumed black. A dark blue is preferred to black for some of the Indigenous Peoples, and I generally avoid black within my icons (unless a religious habit is required). The dress in particular was challenging. It was impossible to work out the pattern from what could be seen in the reference photos. Nor did I know what colour to use. Having tried a few very pale vintage pastel colours without success, I decided to go with cream/sandy colours. I initially thought that it would be too close to the gold leaf on the icon, but the blue sweater framed it adequately. I created a pattern, based on sections that could be seen, and that would be recognizable to viewers of the icons. In receiving archival pictures, I knew that the prayer book/hymnal was the key. It was one that Rose had used herself, which had been translated in the Carrier language, and one which she used to teach the children the Carrier language. It was the clearest symbol for the icon, which connected her spirituality and cultural heritage, and the Carrier Nation. The book is depicted as opened to Hymn No. 5. ‘Truly ět šta’ (Really there he sits, The Real Presence). The archival pictures also presented a selection of her floral and ornamented artwork on the altar linens. The flowers are included along the bottom of the icon. As the design was in progress, a question was brought to my attention about the use of a halo. Rose was just beginning her journey towards canonization. The question was whether a conventional red halo would be premature. But to keep the icons timeless, and recognizing her sanctity in the interim, I chose a variation to honour Rose, using her inscription, which will remain applicable even once she is proclaimed Beatified or Saint, and use a light blue halo. One last note which posed many attempts in the portrayal, was Rose’s deformity from her childhood accident. Rather then overlooking the curved spine, or minimizing it, her deformity had to be honoured. It had become a painful life-long condition. But presenting the deformity with sensitivity posed challenges in how it affected her stance; complicated by a sweater, not within the iconographic norms robes, veils etc. 1940s garments had to worked in with the same reverence and prayerfulness of other icons. Rose’s path to Sainthood has come as a surprise for some, with the unexpected discovery of her uncorrupted body. The title of the article by Marie Flouriot ‘An Extraordinarily Ordinary Life’ is precisely Rose’s gift and example to the world. . There were no works of wonder, no collected writings, no followers prior to her death. She was buried with no added significance than any other student, and in the same cemetery location, which later required the relocation of those buried there. It was only at that time that she was discovered as being uncorrupt. It was interesting how her ‘ordinariness’ seemed inadequate to explain the uncorrupted discovery by witnesses of her time. Her ordinary life doesn’t fit expectations of what a saint looks like. But that is the very thing that brings us hope, in seeing an ordinary person recognized and being a guiding light for us all, in just living a good and steadfast life. The icon is 22”x28” and written on Baltic plywood covered with gessoed muslin, and written in archival acrylic and finished with 23K Patent Gold. * ‘Uncorrupted, The story of Rose Prince’ DVD Produced by Gold Star Productions Inc.
24" x 32" Archival Acrylic on wood covered with gessoed muslin. When I commissioned to write an icon of Rose Prince, the journey began in gathering all available information about Rose Prince, her story, and the discovery of her uncorrupted body. I had seen the painting of Rose, which has been part of the grassroots devotion and pilgrimages to her grave. It is a caring image which establishes Rose’s identity by being depicted in a buckskin dress, and holding a talking stick. With the residential school portrayed in its background, my sense is that it was a means of highlighting Rose’s sanctity in an institution, which remains a strong trigger for many others. Having decided that the residential school could not be included within this icon, the task was to find the connection to Rose’s interior life within an environment that she chose to remain in, primarily because of her physical restrictions, and her spiritual need to remain close to Jesus and Mary. In the hope of finding Rose, I initially looked for internal images of the chapel and workrooms, knowing that the Chapel was central to her life, as was her work with the students. The dress in particular was challenging. It was impossible to work out the pattern from what could be seen in the reference photos. Nor did I know what colour to use. Having tried a few very pale vintage pastel colours without success, I decided to go with cream/sandy colours with the blue sweater framing it adequately. I created a pattern, based on sections that could be seen, and that would be recognizable to viewers of the icons. The archival pictures also presented a selection of her floral and ornamented artwork on the altar linens. The flowers are included along the bottom of the icon, and her IHS symbol and the Cross with Flowers are also added on either side. Lastly, in trying to choose the best-painted framing, her ornamental border on one of her Tabernacle veils, was the perfect choice. The painted icon is set within the Lejac area, with Fraser Lake in the background. As the design was in progress, a question was brought to my attention about the use of a halo. Rose was just beginning her journey towards canonization. The question was whether a conventional red halo would be premature. But to keep the icon timeless, and recognizing her sanctity in the interim, I chose a variation to honour Rose, using her inscription, which will remain applicable, and use a translucent halo with a light blue rim, more an ora then a halo. The icons is 24”x32” and written on Baltic plywood covered with gessoed muslin, and written in archival acrylic. In collaboration with Romeo Crow Chief of the Siksika Nation. The project of the Siksika Sacred Heart Icon was followed by another collaboration with Romeo Crow Chief of the Siksika (Blackfoot) Nation, this time for an icon of the Siksika Immaculate Heart of Mary, as a pair. It too, would be of the same size (24”x32”), having a painted frame of the Four Directions,’ and. addresses the need for a Siksika (Blackfoot) Nation icon, connected to the Blackfoot tradition and culture. 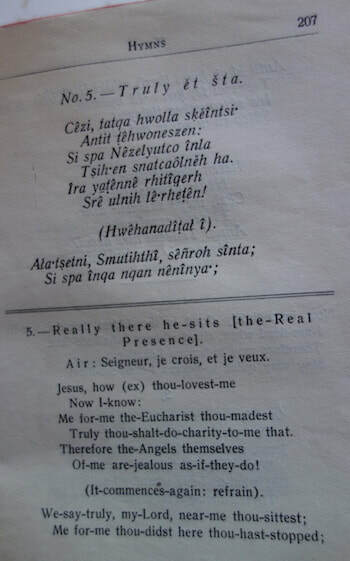 The devotion is the Immaculate Heart of Mary, but the chosen Siksika inscription was to keep ‘Naatowa'poiss Kiksipaahpi’, which translates as Sacred Heart in Blackfoot. The main difference between the devotions to the hearts of Jesus and Mary is that the one concerned with Jesus emphasizes his divine heart as being full of love for mankind, while devotion to Mary's heart is essentially concerned with the love that her heart has for Jesus, for God. It is not an end in itself, so the love of her heart is meant to be a model for the way we should love God. Her heart is immaculate, that is sinless, and she is the only fully human person who is able to really love God in the way that he should be loved, and chosen to be the Mother of God, the Theotokos. The icon is positioned within a traditional setting, with Mary being within the community as model and mother. As with the Sacred Heart icon, it includes the same two Blackfoot tipis, but now, the camp is set near the Bow River in view of Castle Mountain in Alberta. The front tipi still bears the design for Romeo Crow Chief’s family, and the entrances to both face the centre of the icon, to Mary. The chosen setting of this icon, the lands near Castle Mountain, is significant because it is deeply rooted to the Siksika Nation. The basis of the claim leading to the recent 2017 settlement with the Government, addresses the wrongful taking of the Siksika land in 1911, when it was added to Banff National Park. “As one of our last untouched sacred sites, Siksika will be working collaboratively with Parks Canada to share a unique Northern Blackfoot culture…” Weasel Child. Mary is portrayed in full Blackfoot Regalia, wearing the traditional buckskin dress, which belonged to the commissioner’s mother. It has a turquoise blue beaded yoke with the typical short fringe worn by the Blackfoot. The yoke beading provided a strong connection to the chosen setting of the Bow River and its pristine colour. The yoke is also lined with hanging strands of beads and thimbles. Instead of the traditional beaded pendent with a neck strap, the pendant is of the same size as used in the Sacred Heart icon, but Mary’s pendent is superimposed over Her Regalia with no neckband. It is reminiscent of the emblazoned heart seen in Western imagery of the Immaculate Heart of Mary. The Siksika beaded pendant is of the same size and colouring as of that in the Sacred Heart icon, but was adapted to depict the Immaculate Heart with the crown of white roses, a flame of love, and pierced by a dagger rather then a crown of thorns as used in the Sacred Heart icon. The dagger is depicted as a Blackfoot blade and handle, referencing the passage of Luke )"a sword shall pierce...") and brings to mind the sorrows she endured during her lifetime, especially during the crucifixion. In addition to tradition adornments of hair feathers, bone choker, braid pendants, and bracelet, Mary is holding a feather fan which is made from Plains Eagle feathers, and decorated in beading, repeating the designs on Her yoke. The folded shawl on Her left arm is that which belonged to the commissioner's grandmother. The aim of the devotion and of this icon is to unite the Siksika (Blackfoot) Nation, as all Humanity, to God through Mary's Heart, involving the ideas of consecration and reparation. A person is consecrated to Mary's Immaculate Heart as a way of being completely devoted to God. This involves a total gift of self, something only ultimately possible with reference to God; but Mary is our intermediary in this process of consecration. 24" x 28" Archival Acrylic and 23K Gold on wood covered with gessoed muslin. 30" x48" Archival Acrylic and 23K Gold on wood covered with gessoed muslin.